MadKudu Fastlane + Chili Piper enables you to let your qualified leads book meetings directly with your reps after they request a demo. 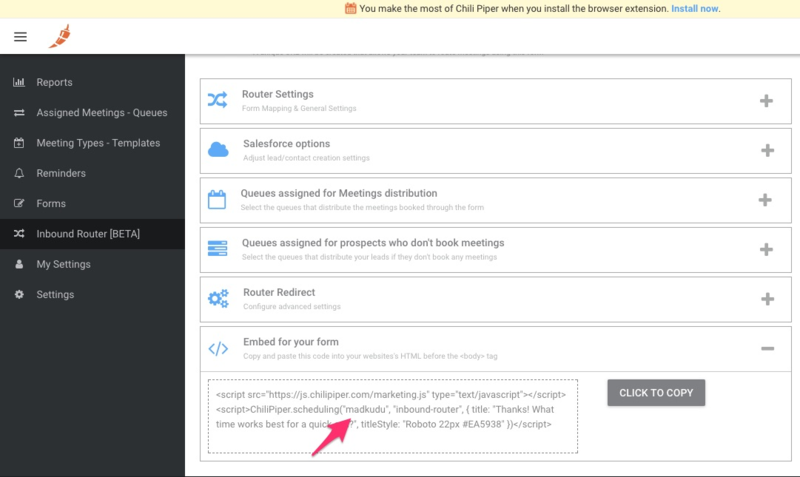 To find your Chili Piper Router, copy the code from your Inbound Router. Use the preview functionality to test the Fastlane functionality. Warning, while using Fastlane in preview mode does not impact your production form, any meetings booked in preview mode will be recorded as actual demos booked. Make sure to remove those meetings afterwards or let your sales team know. When possible we recommend testing with a staging calendar to avoid any confusion. Once you’re satisfied with the preview, turn the form on and publish it. It should return true indicating the form is now live and ready to better your demo booking experience for qualified prospects.